What Certifications and Licenses Do Welders Need? According to the Bureau of Labor Statistics (BLS)1, welders are needed in all types of industries. In the next few years, welders will be needed to shore up the aging infrastructure across the country, work on oil and gas pipelines, as well as build new energy extraction facilities, among others. Although few companies may hire an inexperienced welder, the BLS reports that most employers look for welders who have been trained and certified. Welding certification is offered by several different welding organizations. It is a procedure to determine if the applicant for certification has the skill level required to perform the designated tasks. Certifications verify that the welder is familiar with codes specific to the required work and can perform in compliance with those codes. It also verifies that a welder knows how to perform duties according to contract specifications. Different certifications are offered depending on what type of work the welder seeks. In addition to verifying that a welder can work with certain codes and contracts, certifications can also attest to a welder’s ability to work with specific metal thicknesses, certain types of welds and other specific welding considerations. There are a number of welder certifications available and this is definitely not an area where one size fits all. The AWS offers several pathways to welding certification depending on the specific job, goal or education of the welder desiring the certification. For instance, a professional welder needs a different certification than a welding inspector. 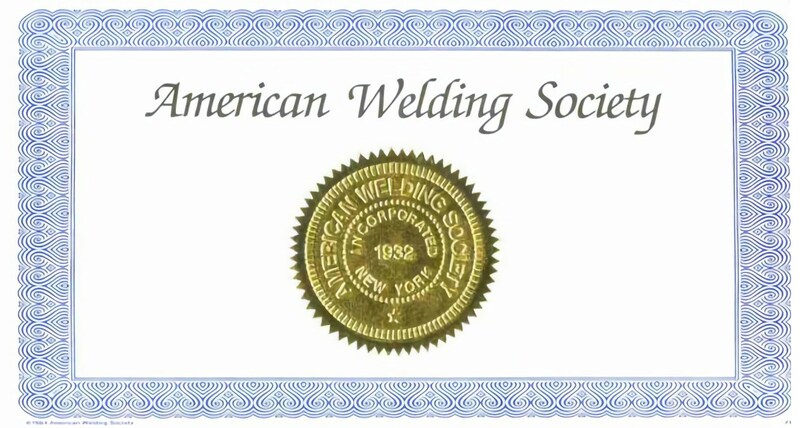 The AWS partners with the Ironworkers Union and the Sheet Metal Institute to provide welding certification and testing centers to certification applicants. Certified Welder: There are no prerequisite educational courses required in order to be eligible to take this performance-based test. Applicants are tested on their ability to perform according to all aspects of a selected Welding Procedure Specification. If the test is not passed the first time, it can be retaken. Certified Welding Inspector: This test requires certain educational courses as a prerequisite to taking the exam, as well as a certain number of years of experience. There are some provisions for substituting experience for course work. It is a written and performance test. Certified Robotic Arc Welding: There are a number of requirements that must be met in order to be eligible to take this exam, which includes a performance test where applicants are required to demonstrate their skills. Certifications from the AWS generally relate to codes dealing with structures such as bridges and buildings. Other industries offer welding certification depending upon the type of welding that is required and the actual work that will be performed. Here are just a few examples. Certification by the American Petroleum Institute (API): Welders may be certified to work with codes applicable to the gas and oil industries. Welders are then certified within the industry according to the job they will be performing. Certification by the American Society of Mechanical Engineers (ASME): ASME offers certification for those working with boiler and vessel codes. Welders interested in certification for a specific industry may check with that industry to see if they offer specific welding certification. For additional information on how to become a certified welder, refer to our related blog post. Some states have licensing requirements for welders in addition to certification. For example, New York requires welders to be certified by the AWS or the N.Y. State Department of Transportation. They then must apply to the state for a license. Some cities have their own certification and licensing processes in order for welders to be employed by the governmental entity. One such city is Los Angeles. Although it has its own testing procedure for certifying and licensing someone to become an L.A. City Certified Welder, applicants are required to bring the applicable codebook published by the AWS to the city’s certification exam. Welders who want to work for a local, state or federal government project need to check with their employer, or anticipated employer, for specific welding certification or licensing requirements.